For such a rejuvenating element, water sure can do an astounding amount of damage to your property. If your home or business has been nailed with a pipe burst, basement flood, roof leak, or any other form of property water damage, your mind is probably reeling with worries. Will your floors be permanently damaged? Will standing water lead to a mold infestation and require costly mold removal? What will it cost to put everything back the way it was? 911 Restoration of Denver has the answers—and solutions—to every one of your questions. Our IICRC certified water damage restoration technicians are highly trained to cover every one of your needs. They are experts in water extraction, mold remediation, and even carpet removal and other types of damage repair. Their first and greatest goal is to provide you with immediate peace of mind, so they work hard to ensure every one of your property concerns has been addressed. You can also count on the friendly water damage restoration staff to treat your emergency with a genuine sense of urgency. They know every moment is precious when it comes to minimizing damages from property floods. That’s why specialists are available 24/7/365 and guarantee arrival within 45 minutes of your call. The service you get from 911 Restoration of Denver is efficient, compassionate, and comprehensive, so you don’t have to worry about hiring additional contractors to fix drywall damages or handle mold removal. The road to total water damage restoration may look long to you now, but the truth is, you only need to worry about one thing: calling 911 Restoration. We’ll take it from there. Whether it’s commercial or residential, your property is much more than a building. It’s the one place you’ve chosen to invest your time, resources, and ambitions. You’ve created a life for yourself in this space, and it can be devastating to wake at 3:00 a.m. to the sound of a pipe burst. It’s heartbreaking to watch the space you love flood with water as your mind floods with dread, wondering if these damages force you back to square one. The water damage restoration specialists at 911 Restoration know this feeling well. They’ve seen it time and again in the Denver area, and many of them have felt it themselves in their own homes. That’s why you can count on them to leap into action the moment your call comes in. Immediately upon arrival at your property, water damage restoration techs will conduct a free visual inspection for property owners. They’ll assess the damages and present a clear plan for water extraction and full property restoration. Whatever you need, they’ve got it covered. Emergency roof repair, boarding up, storm repairs…they do it all. They evaluate the risk water damage poses to nearby belongings and pack out anything they think might be in harm’s way. 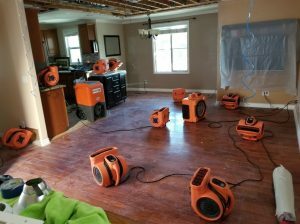 The water damage restoration specialists locate and repair leaks, and they use professional-grade equipment to dry and dehumidify the structures of your home or office to prevent any additional weakening or mold development. If your carpet is ruined due to a flooded basement, they’ll tear it out for you. If a pipe burst has ruined your drywall, they’ll replace that, too. They even conduct mold inspections to make sure you won’t get hit with additional damages from an infestation down the road. Their IICRC certification makes the water damage restoration staff experts in mold removal as well. So if they do discover a colony, you can count on safe and total mold remediation. We believe every property disaster is an opportunity for a bright, new beginning. Our techs work toward the goal of leaving your property even better than new. 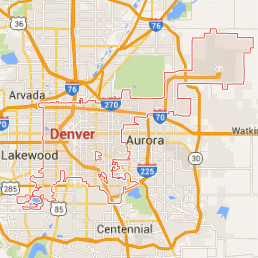 If you’ve been struck by property water damage in Denver, Aurora, Lakewood, or the surrounding area, call us today for a Fresh Start. Does your insurance cover water extraction? Wood flooring repairs? Mold removal? 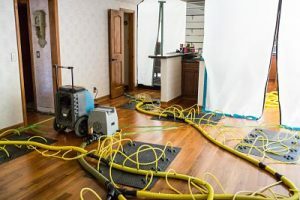 Water damages can be complex and vary widely, so it’s no wonder if you don’t know the answers to these questions. The staff at 911 Restoration of Denver wants the water damage restoration process to be as easy as possible, so they take the extra step of offering a free insurance consultation. They take a look at your plan and guide you through your coverage, providing a clear understanding of exactly what your provider will pay for. They even assist with filing a claim, loss itemization, and billing your provider directly. You can rest assured that 911 Restoration accepts your insurance, no matter who your provider is. We work with everyone. From your first call to the handshake goodbye, 911 Restoration of Denver makes it clear that you have an ally in us. Even if you’re standing in three feet of water as you read this, we want you to know full property restoration is closer than you think. Take a deep breath, call 911 Restoration, and get ready to put today’s disaster behind you.